Vintage Racing Club of BC | Fandango Comes Home! 18 Dec Fandango Comes Home! 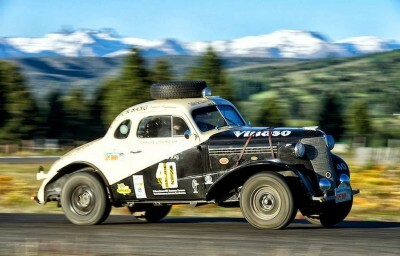 Many Vintage racing enthusiasts will recognize this 1938 Chevy – now affectionately known as Fandango – as representative of those used by the legendary Juan Manuel Fangio to establish his reputation in the very tough, very long road races in South America in the 1940’s, before he headed to Europe and worldwide fame. Long time friends of the VRCBC, Pam and Chuck Lyford discovered this car at a friends and had it restored to its original race condition. They then entered it in the 2013 Vintage Cape Horn event; a 6,000 km(!) ‘adventure drive’ (yeah, right!) from Buenos Aires to Cape Horn through Argentina and Chile. Not only that, but they won! 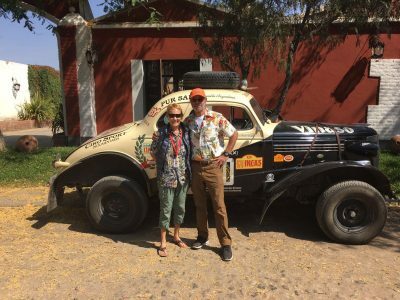 Click here to read Pam and Chuck’s excellent blog about their fascinating adventure. With a little imagination, this could be a photo of Chuck and Fandango coming out of Turn 9 in a Vintage race at Mission Raceway Park Road Course! We wish! Our congratulations to Pam and Chuck.